All the valuable metals make the street value of a catalytic converter pretty high for a grungy-looking piece of metal. They go for $100 and up. 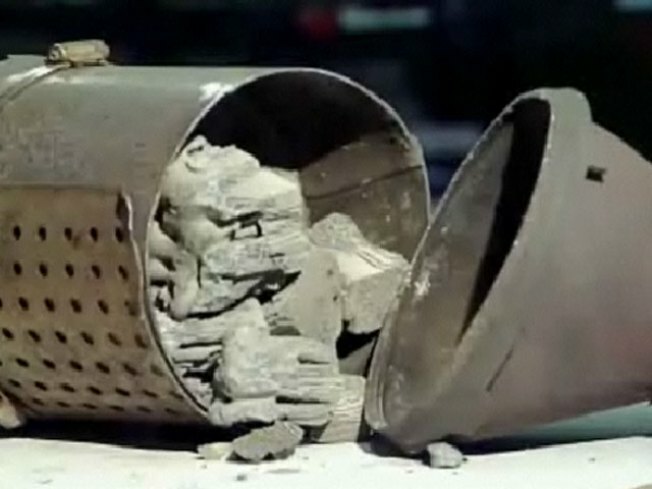 If you take a look inside a used catalytic converter, nothing looks salvageable, much less valuable. But some of the gray gunk in there can be processed to go into pricey jewelry -- and because of this, the grimy auto parts are becoming prime targets for thieves. "I had never heard of this," victim Dana Dooley said. "I saw from across the street the exhaust was hanging down from the bottom of my car." One day last summer, someone slid under her Jeep Grand Cherokee and stole her catalytic converter in the span of one hour. At the time, Dooley's kids were on a Bucktown park jungle gym just yards from the parked car. The thief took just a few minutes to remove the converter, which cost Dooley $600 to replace. "I couldn't believe it had been cut," she said. "Laying underneath my SUV with his feet sticking out, it definitely could have looked like he was trying to fix his own car." Al Jacobson, a manager at a nearby Midas shop, said he has plenty of stories about stolen catalytic converters. "The Jeep Cherokee is the most popular one," he said. Jacobson said he sees them on an almost daily basis. "I had three alone, just yesterday," he said. On the day NBC5 visited, the shop had a Toyota Land Cruiser on the lot, its catalytic converter unmistakeably missing. It had been stolen the night before. Stealing catalytic converters may be dirty, but the work is also quick. Surveillance video from a Hyundai dealership in Oak Lawn shows two men crouching next to cars. Police said the next morning, they found that 36 vehicles had been hit. Catalytic converters were cut out and whisked away to the black market, according to police. It takes a leap of faith to picture the contents of the grimy engine part ending up in a jeweler's case, but there are actually three types of precious metals that can be processed out of all the gunk found inside a used catalytic converter. The metals include the very pricey platinum, currently worth $1,500 an ounce, rhodium at $6,400 an ounce, and palladium at $350 an ounce. It's a growing part of much larger problem: a scrap-metal stealing spree nationwide, open season on all types of metal -- especially copper, Parker reported. The problem hit home for Illinois state Sen. Debbie Halvorson. "I went to my condo and found my air conditioner in pieces," she said. When Halvorson realized the thief was as long gone as her copper, she co-sponsored legislation intended to hit the thieves where it hurts. When the law takes effect in January, scrap dealers will have to record three forms of identification on anyone selling $100 or more of metal. "Why can't we convict or fine or catch people that are the perpetrators?" Halvorson asked. "The bigger picture is, not only will the scrap dealer record and keep records for a year, but we are increasing the penalty of the fees." It's hard to say who's at the end of this food chain. Arrests have been made of converter thieves, but appparently not the people melting them into precious metals, Parker reported.